Available through Amazon, Ingram Wholesale Book Club, Indie Bound, and the e-book is on Amazon’s Kindle and the Apple iBookstore. In late 1940’s—the final years of Korea as one country—when most brides and grooms were married sight unseen, Gui-yong and Eum-chun strike gold by finding a love as sweet as sticky rice. But their love for each other and for their secretly adopted daughter is not enough as they must soon accept the unthinkable—a mistress moving in to bear Gui-yong the male child, a necessity in a society smoldering in Confucianism. Soon, torn apart by the Korean War, they endure years of separation and terrors as each side of their divided nation seeks total annihilation of the other. When the family is reunited, it falls on the shoulders of their daughter, Mi-na, to figure out how to keep their love burning through this life and into the next—and ultimately make sense of the past. For the characters in this novel, surviving heartaches and a war that claims 1,000,000 lives is not enough. How they live—with grace and dignity—in sync with the ancient voices of heaven, even as they break their hearts, matters most. The story reveals the realities of both the old and new Korea. The Confucian values that rule these characters still shape the lives of people in North and South Korea. Flowing from her first-hand experience of growing up in Seoul during the Korean War, Maija Rhee Devine’s novel reveals uniquely Korean colors and sounds as she leads readers through an extraordinary love story that parallels the tragedies of the war. Seoul Selection USA takes a leading role in the globalization of Korean culture. Though located between much larger China and Japan, Korea boasts a huge repository of sophisticated and original indigenous culture, much of which remains to be translated and made accessible to non-Korean speakers. Seoul Selection seeks to boost the world’s understanding of Korea through the publication of works on a wide and diverse range of Korean topics, including history, culture, tourism, economics, society, education, and more. In an age of information overload and mass marketing, Seoul Selection aims to play the role of a dependable guide, selecting and providing easy access to high-quality samples of Korean culture to those looking for a taste of this fascinating country. 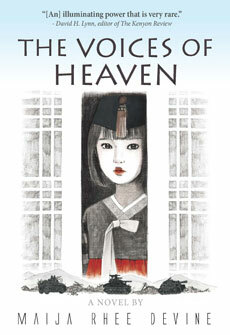 Praises for "The Voices of Heaven"
"Maija Devine writes with grace and an illuminating power that is very rare. She manages to capture the fault line between cultures and languages desperately trying to connect and make sense of each other while remaining faithful to themselves. Her skill and promise are enormous; the power of her narrative art rewards any reader." Maija Devine's inspiring storytelling in THE VOICES OF HEAVEN gives voice to the countless voiceless ones who have gotten swept along in the dire necessities of nation-building and war in South and North Korea over the past half-century. This is a beautiful book about wars waged at the most intimate levels imaginable for basic rights of freedom and self-determination. Each page is like a carefully-carved open doorway into this still-secret corner of the world and the lives of the women and men who somehow endured the very personal tragedies captured here. “Maija Devine’s first novel fills a gap in English-language fiction by painting an authentic portrait of Korea. The story’s characters are ordinary Koreans of their time—people with strong emotions, a commitment to family, respect for tradition, and, less laudably, discriminatory attitudes toward women. The dialogue is lively and crisp and the descriptions of daily life evoke the very sights, sounds, and smells of traditional Korea. This book is truly a joy to read. “Stifle your laughs,” Mrs. Chong told her daughter, Soo-yang. Laugh? Why would she laugh? Tomorrow, she’d slip into bed with another woman’s husband, his wife lying in a room three feet away behind thin, rice-paper doors. That’s how her life as a mistress was to begin. So, what happy tune would she be wriggling her shoulders to, giggling like an idiot who couldn’t tell red beans from black beans? “Never show your teeth,” Mrs. Chong said. “Breathe quietly, and keep your eyes turned down to your toes.” Her mother was shampooing her hair in reed-scented rainwater in their yard in preparation for her arrival at his house. It was an important occasion, even if it could hardly be called a wedding. Tomorrow night, as Gui-yong would loosen the tie of her bedtime blouse, she’d remember neighbors’ gab about him and his wife, the mandarin duck sweethearts, just like in the fairytales. What misfortune to squeeze between the two, still love-struck with each other even after fifteen years of marriage! “Such love, as sweet as the sounds of harp strings,” her mother had said, “could work for you, too. Harp-string love for one woman could sing the same tune for another. A man who glues himself to one woman like sticky rice will do it again. It’s a good sign.” A good sign? What kind of a spineless man glued himself to two women? Soo-yang, Weeping Willow, wanted him to have some balls. Oh, my. She blushed. If he had them, he wouldn’t tear his affection away from his wife so easily. Still, she’d rather yield herself to a loving man than to one as cold as a lizard. “Welcome to my husband’s bed.” Eum-chun practiced the words she must say to the woman coming tomorrow. “Bear him a son,” she added. She darted out the kitchen and, holding onto the cement rim of the sink in the yard, heaved. A thread of spittle ran down to the drain. She kneaded her chest. Charcoal— burning, burning, burning. That’s how it felt there. If the rumors came true, North Korean Communists could make a pile of dry leaves out of the South with machine guns and tanks any day. Seoul would turn into waterfalls of blood. And what was she doing? Dillydallying over having to share her man—as if not having borne him a son wasn’t her fault. Dull peach colored the dawn sky like persimmon juice spreading through gauze. The curved edges of the gray tiles on her roof gripped the back ends of the others, making neat rows moist with dew. Without a son, a family would be like a roof with missing tiles. Fifteen years ago, when she saw her husband for the first time on their wedding night, oh, how effortlessly she fell for him. During the day, her eyes had been glued shut with honey to keep her from drawing bad luck by peeking at Gui-yong. A warmth that develops slowly between a man and a woman during the first years of marriage would have been good enough for any newlyweds, but instead, she flung her heart open the moment she saw him. Below his bushy hair and brows, she caught his eye. They glinted with a look of having seen her before, but he couldn’t have. His eyes were small—how she favored large ones!—but there flashed humor. His upper lip curved slightly, revealing something he was holding back from her, teasing her. She giggled. Sweetness welled. She stepped into the kitchen and dropped another dried whiting fish into the water for the wedding soup she’d make tomorrow. The two fish she let soak earlier had softened. At the poke of her chopstick, their sides flaked away, but the eyes remained whole and stared. Dumb fish. “Don’t fall apart like them,” she said to herself. “What right do you have to behave so childishly?” Having had one miscarriage and no son, she had left gaping holes in the roof of their house large enough for hail to pelt through. Without a boy to shoulder her husband’s family line, how could they survive in this life, and the next? When they grew old, who’d bring them steaming rice on a cherry wood tray? When they fell ill and the money dried up, who’d keep them from begging on the streets? After their death, who’d help them to enjoy eternal life by offering ancestral rites three times a year? Daughters were as good as wet straw shoes. Once married, they became outsiders. The least she could do to redeem herself was to hold a wedding party nobody would deem shabby, like a model wife. Not to do so would be like lying on her back and spitting into the sky. The spit would spray onto her parents’ faces, too. Gods knew she’d never want that. after her. Luck and love seemed to work that way; they favored some men over others. The unlucky, like Noodle Leg at the office, grumbled about the “wife smell,” which he said drove him to other pussies. Gui-yong had his share of chances to fool around with other women. If it hadn’t been for what he had with his wife, he would have, too. He parked his truck by the Quonset hut of the City Hall Transportation Division. He’d get a short route today. He wanted to get home for dinner with his wife one last time without the new woman. Fifteen years ago, to get a glimpse of Eum-chun before their wedding, he had pried her address from the matchmaker and prowled her neighborhood. Why? Not seeing their brides’ faces until their wedding day didn’t drive other men crazy. A week before the wedding—on the third day of the third lunar month, when swallows returned from the south—he finally saw her. Behind the bush clover fence of her home, she was taking clothes off the line.